The Government’s focus should be on making entrepreneurs out of large segments of civil society, especially those belonging to Scheduled Castes/Tribes or Other Backward Classes, rather than providing limited job opportunities in listed companies. This will go along way in enhancing the economic and social status of these segments, says R. Vaidyanathan. A DEBATE is currently raging in the polity regarding reservations for Scheduled Castes/Tribes in the private sector, similar to the one that is provided in the government and the public sector. The demand is based on the issues of social equity and also due to the possible, privatisation of public entities. Whenever private sector is mentioned in our polity and in discussions among the metropolitan elite it is assumed to be the listed companies of the private corporate sector. Visibility and hyped exposure in the electronic media may have contributed to this impression. Private corporate sector constitutes, relatively a small portion of the national income, of 12-14 per cent. Let us look at the employment statistics pertaining to the private sector. We do not have separate statistics on the number employed by the private corporate sector and proprietorship and partnership (P&P sector) forms of organisations. Many companies do not provide information on the number of people employed by them as they are not required to. First the facts: Table 1 provides the number of persons employed in government and semi-government organisations for selected years. We find that the employment in government and public sector has stagnated in the 1990s and shown a decline in the last two years. The reasons are two fold. One is the non-expansion of governmental activities particularly pertaining to public sector compared to the socialistic approach of the 1960s when bread to rockets were made by the government. Two, the Government is broke, especially at the State level. Salary wages and pensions constitute more than 50 per cent of the revenue of many State governments. The dependency ratio (namely, the number retired to that on rolls) is increasing at an exponential rate for most governments/departments. Hence, theopportunity for employment in the government is significantly reduced and it impacts SC/ST also. Table 2 provides the employment data for the private sector for select years. According to the Economic Survey, 3.3 lakh persons were employed in trade activities (wholesale and retail) in 2002. This presumably includes hotels and restaurants also since separately they are not provided and they come under trade category in our statistics. The number of people employed by the construction industry is 56,000. But in a city like Bangalore itself, there may be more than a lakh people working in construction activities. In transport, storage and communications, according to the Government, there were 76,000 workers in 2002. It is indeed tragic that important debates are conducted using such data on employment and major national policies are formulated using such fiction. The Government and the private organised sector have only a small share (8-9 per cent) of the total work force of the country. The organised private sector employs a total of 84.32 lakh persons which is less than 3 per cent of the total work force (of nearly 350 million). Under the circumstance, even if the entire organised private sector is reserved for the SC/ST/OBC the gains from employment will be very meagre. But the perspective needs to be different. The more pertinent issue is the share of SC/ST/OBC in the ownership of the private sector. We have the exhaustive Economic Census 1998, conducted by the Central Statistical Organisation (CSO) which covers 30.35 million enterprises engaged in different economic activities other than crop production and plantation. It deals with own account enterprises as well as establishments, an enterprise run by employing at least one hired worker. It covers private profit and non-profit institutions, cooperatives, and all economic activities including dharamsalas/temples. Table 3 gives the salient findings pertaining to ownership of the enterprises. We find that nearly half of all enterprises are owned by SC/ST/OBCs in the rural areas and the same is nearly 38 per cent in the urban areas. This encompasses manufacturing, construction, trade, hotel/restaurant, transport, finance and other services. The Enterprise Survey reveals that of the total of 30.25 million enterprises in the country, 24.39 million (80 per cent) were self-financing. This speaks volume about our credit delivery systems. What is required to be debated is the enhancement of credit systems for enterprises, especially to those owned by SC/ST and other backward communities. In other words the focus should be on “Vaishya-vaisation” — the enterprise class of the Varnashrama — of large segments of our civil society, instead of creating a vast set of “proletariat” in the fashion of 19th century models. 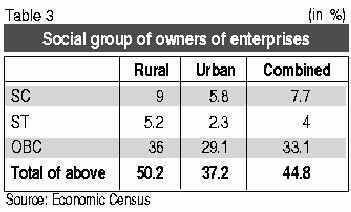 The Enterprise Survey also points out that the overall growth rate of enterprises owned by persons belonging to the SC category has significantly declined from 3.42 per cent in 1980-1990 to 0.40 per cent in 1990-1998. The decline is observed both in rural and urban areas but in the former the growth is even negative (-0.41 oer cent). This issue needs debate and detailed study by policy planners. Is the decline due to migration of SC segments to the urban areas or due to inadequate credit availability? In contrast the growth rate of enterprises owned by persons belonging to ST category has significantly increased from 4.16 per cent (1980-90) to 6.64 per cent (1990-98). The increase is sharp in the urban areas, from 2.37 per cent to 12.24 per cent. This is interesting. The reasons for such growth also needs study by planners for replicating those cluster efforts. There are inter-State variations in terms of industry focus among these social segments which also require a closer study to encourage and enhance entrepreneurial activities by these social groups in different States. Incidentally one of the arguments given is regarding enhancing the “Social Status” of these segments. Social backwardness, it is pointed out, as a valid reason for caste-based reservations compared to reservations based on say economic criteria. In today’s context politics, cricket and cinema/TV provide substantial social status and hence the demand should be in these areas, compared to corporate keyboard punching. The Marxist postulate is that it is “inevitable” that the “petite bourgeoisie” becomes a proletariat in the process of growth of capitalism. The Corporate Globaliser who belongs to the metropolitan elite also argues about “scale efficiency” and “modernisation” and feels that the “rational route” is for all these small Vaishyas (entrepreneurs) to disappear and become blue/white-collar workers for the cause of “global efficiency”. Policy planners and experts must work on a road map to calibrate changes in our context. Let us remember that Wal-Mart was built in the rural America by liquidating thousands of mom and pop stores, which are equivalent to our street-corner shops. The invasion of the Internet and cell phone present opportunities to innovate in linking millions of small “Vaishyas” (entrepreneurs) to create scale economies. The Indian civilisation has, over centuries, always been innovative and creative in finding solutions to social problems. Maybe the time has come for the government to perform mainly the task of a Kshatriya (provide internal and external security) and encourage large segments become Vaishyas (entrepreneurs) through instrumentalities of credit delivery, taxation, social security and development of regional and community based clusters, etc. This may go a long way in enhancing the economic and social status of the SC/ST/OBCs rather than providing some limited job opportunities in listed companies.